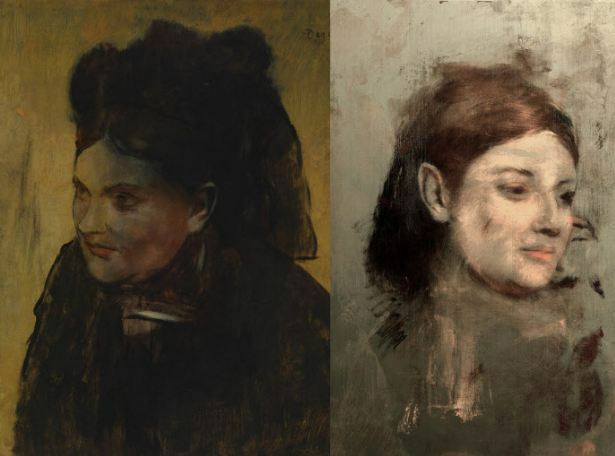 PARIS (AFP) -- Researchers used super-X-ray vision to peer beneath the surface of a portrait by impressionist Edgar Degas and gaze upon the model whose likeness he painted over nearly 140 years ago, they reported Thursday. The woman, whose image Degas turned upside down before using it as a base for a new painting, was probably Emma Dobigny -- a favorite model of 19th century French artists, the team announced. “This has been a very exciting discovery,” said David Thurrowgood, conservator at the National Gallery of Victoria, Australia, where the painting hangs. The existence of the “underpainting” has been known since about 1920. A vague, ghostly figure has been slowly emerging, spreading an increasingly dark stain over the face of the model that replaced her. But previous attempts to glean something about the jilted original yielded little more than a faint outline. The hidden image “has long been considered to be indecipherable” without damaging the surface painting, the research team wrote in the journal Scientific Reports. Enter the Australian Synchrotron in Victoria, a particle accelerator which generates radiation for high-resolution imaging in research, therapy, or forensic analysis. The light it produces “is a million times brighter than the Sun, many orders of magnitude greater in power and intensity compared to standard, hospital-like X-rays,” synchrotron scientist and study co-author Daryl Howard told AFP. “Because of the brilliant light, we are able to reveal unprecedented structural detail of any material”. Using a technique called X-ray fluorescence, the team became the first people since Degas to gaze upon his model's face. 1869 and 1870 when she was about 16. “We observe (a) strong resemblance between the revealed underpainting and several of Degas’ portraits of Emma Dobigny,” wrote the study authors. According to former Louvre Museum director Henri Loyrette, a recognized Degas expert, “it is entirely possible” that the face belongs to Dobigny. The name of the black-clad woman who supplanted her on the canvas, however, remains unknown. 1876-1880 -- is entitled simply “Portrait de Femme” (Portrait of a Woman). Degas had not applied a new basecoat, and used thin layers of oil-based paint which are now losing their “hiding power,” said the authors, allowing Dobigny to start showing through. The researchers used the synchrotron to create eleven “maps” of the original canvas -- each of a different metallic element in the pigments Degas used, including arsenic, copper, zinc, cobalt, and mercury. The process took about 33 hours. Put together, the elemental maps provide a detailed reconstitution, revealing even the artist‘s brush strokes. The colors, however, have to be inferred. A blurred section in Dobigny’s hair suggests Degas had made several attempts at reshaping an overly pointy, pixie-shaped ear -- a quirk he was apparently known for at the time. “Concealed paintings, early compositions that have been hidden by subsequent work, are important insights into artworks and artists,” wrote the team. The researchers said they knew of no other method that would have worked as well as synchrotron scanning, which was also used in 2008 to reveal the portrait of a peasant woman underneath Vincent van Gogh’s “Patch of Grass.” The technology “will significantly impact the ways cultural heritage is studied for authentication, preservation and scholarly purposes,” the team concluded.